LOS ANGELES, California, April 29, 2010 (ENS)  The County of Los Angeles violated the federal Clean Water Act when it discharged polluted water onto the world-famous Surfrider Beach at Malibu, according to a decision issued Tuesday by the federal District Court in Los Angeles. The court also found the county liable for illegally discharging polluted water into a marine coastal preserve in northern Los Angeles County, one of three dozen designated Areas of Special Biological Significance along the California coast. This lawsuit is the first to enforce California’s prohibition on polluted discharges to designated Areas of Special Biological Significance. 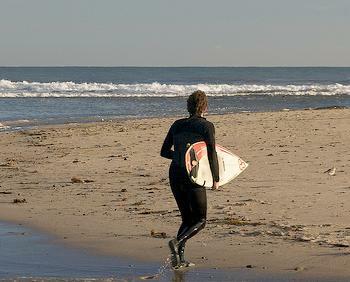 The area at issue lies between Mugu Lagoon in Ventura County and Latigo Point in Los Angeles County, and includes the popular Surfrider Beach and surrounding waters, in which the state has established a zero-tolerance policy on bacterial pollution discharges during dry weather months. These court decisions were the result of a lawsuit brought by the Natural Resources Defense Council and Santa Monica Baykeeper. As a remedy for the violations identified in the court’s ruling, NRDC and Baykeeper will seek a court order requiring the county to reduce runoff pollution levels to a level that protects public health and the environment. But the court rejected the claim that the county also violated the Clean Water Act when it discharged polluted runoff into Malibu Creek and the Santa Clara, Los Angeles, and San Gabriel Rivers. Although monitoring in these rivers conducted by the county showed violations of water quality standards, the court found that evidence did not pinpoint the county, as opposed to other dischargers, as the source of illegal levels in those waters. NRDC and Baykeeper are asking the court to require the county to take steps that include adopting better pollution monitoring, requiring treatment or redirection of polluted runoff, and implementing green infrastructure measures to reduce or eliminate polluted runoff. “There are a variety of practicable and low-cost remedies, including green infrastructure techniques such as permeable pavement, cisterns, and other water retention and infiltration approaches that cleanse water and can also supplement local water supplies in the process,” said Beckman. In March 2008, NRDC and Santa Monica Baykeeper sued the County of Los Angeles for violating a 2001 Clean Water Act permit issued by California’s Regional Water Quality Control Board. The lawsuit sought to hold the county accountable to measurably reducing urban runoff, the top source of coastal water pollution in California that sickens thousands of people and fouls coastal ecosystems annually. Beachwater pollution makes swimmers vulnerable to waterborne illnesses, including stomach flu, skin rashes, pinkeye, ear, nose and throat problems, dysentery, hepatitis, respiratory ailments, neurological disorders, and other serious health problems. Senior citizens, small children, and people with weak immune systems are especially vulnerable. The county plays a special role in assuring that runoff meets water quality standards. The county owns and operates more of the runoff discharge system than any other entity and, through the Flood Control District, play a specially-designated “principal” role in controlling runoff pollution. The County of Los Angeles has repeatedly sued state authorities since 2001, seeking to weaken clean water rules.